A big thank you to everyone who participated in our God's Global Barnyard presentations at 9am and 11am worship on Sunday. The congregation loved it! A lot of our Lenten banks have disappeared into the hands of congregants (we actually had to order more), so I'm very hopeful that our story about sharing our resources with all God's family has rallied the congregation to exuberantly support our cause! 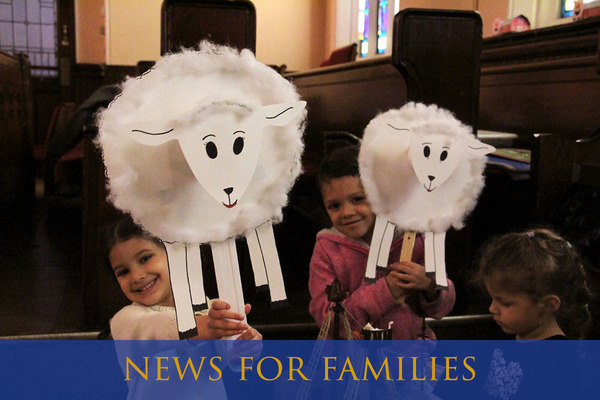 Lenten banks should be returned to us on April 2 and 9, and Mission of the Month envelops and online contributions will continue to be received through March. We'll keep you posted on how we did. Thanks to Ellie for her passion and leadership, Joey for the script, and our first-rate Sunday School teachers, Robbie and Alex, for leading Sunday School while Zachary was on vacation. Zachary returns, very excited to see you all, and to lead regular Sunday School with songs, prayer, Bible stories, and more fun activities this Sunday! Our next Confirmation Class is Friday, April 28 from 6-9pm at the home of Sam Richards. We'll begin learning about the second article of the Apostles' Creed, decide everyone's special roles in worship on May 7, and continue our exploration of Lutheranism 101 with a look at the "Theology of the Cross."